The following is taken from comments made by the PENMERRYL STUD of Virginia USA where Maggie was working at the time. PENMERRYL STUD of Virginia USA is extremely fortunate to have one of the worlds most highly respected and qualified experts of the Irish draught horse and the horse breeding industry, Maggie Spreckley, to run our breeding operation. Maggie brings with her a lifetime of experience. She is one of a short list of people suitably qualified and experienced to inspect and grade both stallions and mares. She is a senior inspector and internationally renowned judge of Irish draught horses, having judged at such venues as the Royal show, the Great Yorkshire and Three counties, in addition to judging appointment in Ireland areas of Europe and the USA. 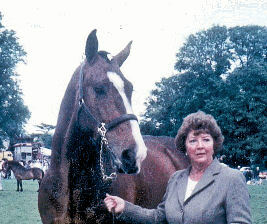 Maggie’s reputation in the show arena is not only as a top judge and an inspector but also as a highly successful competitor, having won at many prestigious shows such as the Royal international and the Horse of the Year show. She has been instrumental in enhancing the Irish draught horses’ reputation as a performance horse and was one of the first people to enter stallions for performance testing. Maggie has produced five stallions for the National Stallion Association performance test, all of which achieved a very high mark and passed grade one, including the distinction of breeding and producing the only registered Irish draught Stallion to be granted the much coveted “elite” status namely Happy Ending. Maggie has worked tirelessly over the years to promote and preserve this wonderful rare breed, holding office within the IDHS (GB) for approximately 16 years, 6 of which were spent as chairman, as well as being a constant contributor of articles to various publication world wide. Maggie has won the Roma Stud breed fertility award on nine occasions at her own Pages Farm Stud in England, by maintaining very high conception rate, including amongst the mares, those of her majesty. Queen Elizabeth II. She has an extremely high knowledge of horse theriogenology and horsemanship. For the last 30 years she has been involved in the final year education of veterinary students and the continuing education of qualified veterinary surgeons through her seminars, lectures and practical demonstration at the Royal Veterinary College, England. It is therefore no surprise that Maggie has stood in excess of forty stallions over the last three decades. She has selected trained and produced no less than nine colts, from foals to maturity, to finally grade as Registered Irish Draught Stallions, all of them tremendously successful individuals. Her record of achievements is unique and the direct result of her exceptionally high standards and professionalism. Maggie intends to run seminars and clinics here at Penmerryl Stud, focusing on conformation, the mechanics of equine structure and movement, preparing horses for showing and inspections, breeding protocol and maintaining the high standard of breeding and evaluation necessary to the continuing success of the Irish draught horse which is of mutual interest to us all.